The first thing we do as soon as we keep a pan on the stove is pour oil and heat it up. Heating oil changes its characteristics. Oil which is healthy at room temperature can become unhealthy if heated above certain temperatures. Heat causes oils to oxidize faster; hence, the best oils to cook with are refined oils like sunflower, safflower and rice bran oil. When oil is heated excessively, it loses it's anti-oxidants which helps in the prevention of diseases like cancer and heart diseases. Refined oils tend to have a higher smoke point and can be heated to a higher temperature before it starts to burn and smoke. 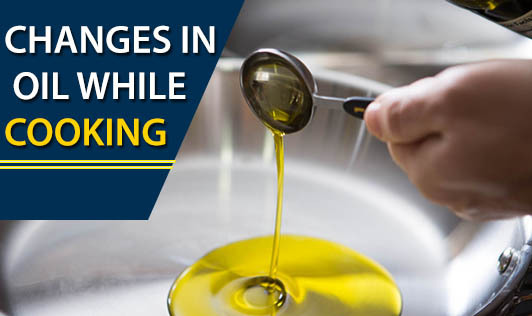 In a study done in UK, USA and Spain, it was found that polyunsaturated oils like corn, unrefined sunflower, soya and canola oils degrade easily to toxic compounds when over-heated. Over heating can change the chemical composition of the oil and can be harmful to us. Polycyclic aromatic hydrocarbons (PAHs), chemicals believed to be carcinogenic, maybe formed when fats are heated to a very high temperature. Prolonged consumption of over-heated oils can cause cancer, atherosclerosis, inflammatory joint diseases, stroke etc. Heating oil to a high temperature not only changes the chemical composition, but also the taste and flavor of the oil. The temperatures we typically use in the kitchen are between 160o C - 230o C. Generally, animal fats have a lower smoke point (120o C - 150o C) and refined oils have a higher smoke point (230o C - 245o C). So, refined oils are the preferred oils for roasting and frying. Make sure you know the heat tolerance of the oil before heating it!